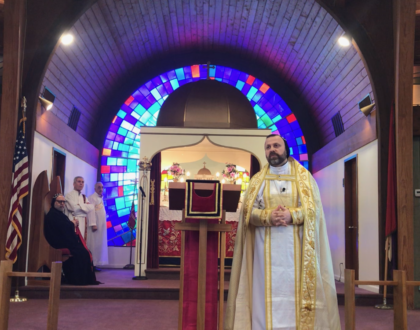 We were recently blessed to host His Eminence Mor Grigorios Melki Urek, Metropolitan Patriarchal vicar of Adiyaman Turkey, to participate in our Holy Liturgy and provide the Sunday sermon. 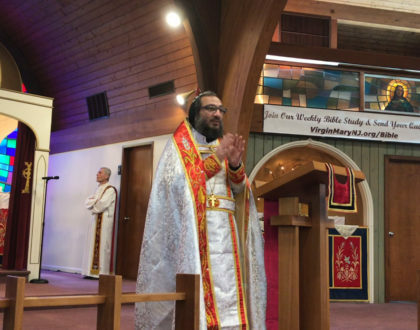 Here is a general English translation of the key parts of his sermon from Turkish. 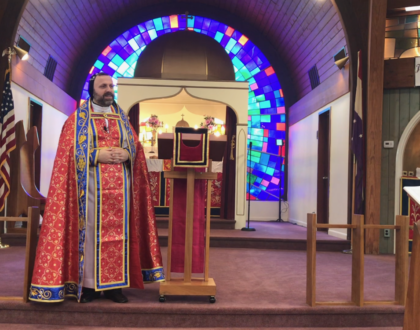 My dear brethren, I am not sure how to say it, but since I know many in this group have come from Diyarbakir, Adiyaman and Mardin, and the surrounding areas, that is why I am going to speak in Turkish. But of course, some people may not understand. We are human beings and can’t be perfect. If we are human, we must have some imperfections. We shouldn’t say we have deficiency, but we are all doing our best to be mature. But besides that, I want to say I am very happy to be here. Mor Dionysus John Kawak has graciously allowed me to attend to today’s mass. We had a chance to perform Liturgy here and we performed the Liturgy at Mor Gabriel. Also, I performed the Friday mass at Mor Gabriel. I feel peaceful and am very happy. My dear brothers, we are Christians. What does Christianity mean? Christian means to be the people who are called in the name of Jesus. Either as a person, or a community, or internationally, we represent the divine church. With this perfect description, we are trying to fulfill Jesus’s wish for us. It is such a holy and beautiful thing that we are sharing God’s work. In this sense, it was not easy to get to where we are today. We gave and sacrificed for the divine light of Jesus so that we can each become a new person, and even give up our old person, so that we gain the Holy Baptism. As you know, when you take the baptism, you remove your old clothing and you wear your blessed new clothing. And be unified with your new being. We need to define our community as a unified and blessed one. Not on the outside appearance, but on the inside. Since we are humans, we have emotions and weaknesses. Those can push us to doubt our faith, even to a non-Christian environment. But the power that is protecting us is much stronger than those emotions. It is a Holy power. The Father of Jesus Christ reprimands Satan through His angels and opens our way. Those who are from heaven speak of heavenly things; those of the world speak of earthly things. The earthly world draws us into these matters so much that God sent Jesus to bring us back. For many generations millions of people were confined to this earthly world. God with his mercy wanted to give us immortality. That’s why these holidays exist – to prepare us for the heavenly Kingdom. John the Baptist prophesied the coming of Jesus. He was the voice of God’s word. The one that is among us is going to take all the world’s sins. In the Old Testament, the Jews sacrificed lambs to God to be forgiven for their sins. So, Jesus is also a lamb that is sent by God to erase our sins. Watch the full sermon video here.